It is not easy to get an employer to hire you for a job. The job market is competitive, and hiring managers need to have high standards to sort through the many applications they receive. Recruiters are looking for the perfect candidate who will be a great addition to the company. It is your job to show them that you are that candidate, and you can only use your resume to accomplish this. It takes a lot to get past the first cut. One of the best ways you can improve your chances of getting the job is to make a resume that stands out. Reviewing eye-catching resume templates helps you create this kind of resume. Learn what it is that catches employer’s attention so you can write the most effective resume possible. Why Use Eye-Catching Resume Templates? You may not know that resumes have a strict length requirement. If your resume is too long or too short, many employers simply will not read it. As a general rule, you should include one full page for every 10 years of working experience you have. To learn more about the specific rules about how long your resume should be, check out these one-page resume templates. 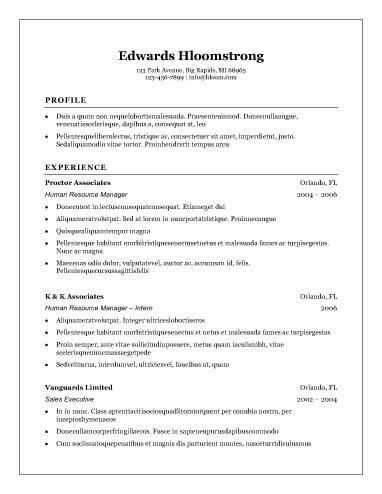 Many modern hiring techniques favor resumes written differently than in the past. For instance, many employers now use a computer to prescreen resumes before a human ever looks at them. If this is true, you can write your resume to succeed in automated screening. Learn these and other modern formatting techniques from modern eye-catching resume templates. Your resume is even more effective if you tailor it to a specific job. When you are writing, you should think carefully about the company you are applying for and what it values. Getting creative with your resume approach can have amazing results. Creative eye-catching resume templates will help you better understand what creative techniques you can utilize. Your resume will be very different if you are applying for an entry-level position. The biggest difference is there is less of a focus on the working experience section. The entry-level resume templates provide examples for all sorts of early jobs, from your first job out of college to jobs perfect for high school students. Just like entry-level positions, internships require a unique type of resume. The attributes you are trying to emphasize are simply different than the ones showcased in a typical document. Employers are usually looking for candidates who could become permanent additions to their company, so you should take a look at eye-catching resume templates to learn the best way to appeal to readers. The most important part of your resume is the content. What you say and the language you use will likely determine whether a hiring manager chooses you. There are many requirements you need to follow to ensure you meet readers’ expectations. Take a look at eye-catching resume templates and the following information to know what you should say in your resume. The contact information should be at the very top of your resume, although it should be brief and subtle. You almost want readers to miss this information until they are ready to contact you. You need to include a professional email, mailing address, phone number, and your full name. The summary should be either a paragraph or a bulleted list. Include three sentences or bullet points. Your summary should act as a hook to catch the attention of employers and encourage them to continue reading your resume. Do not include your objectives. Although employers once expected this, now you should only describe your skills, experiences, and professional attributes. Include information from throughout your resume. The skills section needs to be brief so it guides readers to the work experience section quickly. All the information should be easy to understand even when skimming. Each bullet point should be a few words that describe your skills. Only include skills that relate to the job you are applying for directly. The work experience section is the most important, so you should make sure it is the longest and densest. List your previous jobs in reverse chronological order. Your current position should be in present tense and all others should be in past tense. Include five to eight bullet points for each of your previous jobs. The first word of each bullet point should always be a strong action verb that describes your responsibilities. The education section should be brief. You only need to include your school, type of degree, and date of graduation. You can mention any relevant internships, awards, or affiliations in a section combined with your education. Learning the correct way to construct your resume is vital to getting the job you want. If compiling all of the information and writing your own resume from scratch worries you, try out the resume builder and marvel in your finished document. There are templates and options for all types of industries and formats.